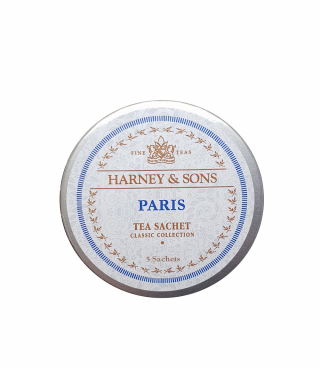 Harney Tea : Paris Tagalong - ubiq bookshop: the best place to buy books! A careful blend of black teas and a trifecta of goodness: vanilla, fruit and lemony bergamot makes Paris utterly indulgent. Sweet notes float delightfully in the air and in each vibrant sip. Reminiscent of one of the most popular teas in Paris, the scent is like the fond aroma wafting out from a tin of vanilla cookies. This charming tea was crafted to pay homage to the city of lights leaving simple words to describe this Parisian-inspired tea- Cest si bon! Tin measures 75mm x 75mm x 20mm and contains 5 luxurious pyramid silken sachets of the finest loose leaf tea.